LOS ANGELES—Girls’ and women’s sports may still be underreported and undervalued, but it seems it’s a hot subject in the theatre right now. 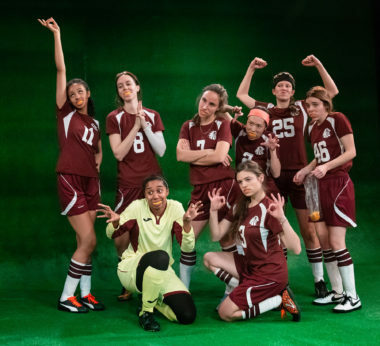 We recently reviewed an all-female cast in For the Love Of (Or, The Roller Derby Play); and now comes the L.A. premiere of Sarah DeLappe’s Pulitzer Prize finalist The Wolves in an Echo Theater Company production. It too has an all-woman cast, all but one members of a competitive soccer team at the junior high school level. Wouldn’t you not want to miss such an event? There’s super-cool #7, the striker (Katherine Cronyn); anorexically thin, kind #2 (Minzi) and childlike #8 (Ellen Neary), both on defense; three midfielders: brainy #11 (Troy Leigh-Anne Johnson), stoner girl #13 (Jacqueline Besson) and #7’s insecure sidekick, #14 (Donna Zadeh). Goalie #00 (Makeda Declet) is an anxious perfectionist given to a nervous stomach, and the awkward new girl, #46 (Caitlin Zambito), who lives outside of town in a yurt with her mom and is just trying to fit in. Team captain, #25 (Connor Kelly-Eiding), does her best to keep the girls focused on the game, and Soccer Mom (Alison Martin), who makes only a single powerful appearance in the play toward the end, provides the orange slices. Once in a while some of their given names are mentioned, but honestly, it’s hard to keep both numbers and names in your head amidst the fleet-footed, far-ranging, fragmentary dialogue that touches on just about everything girls of that age are thinking about. 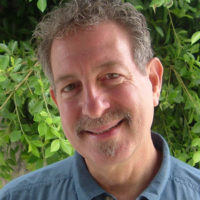 Personal differences, insults and jokes, correct language, resentments, accusations and tensions, friends and boyfriends, ethnicity, the Khmer Rouge and the Preamble to the Constitution, eating, hair, competition, menstruation, pregnancy and abortion, illness and zits, secrets, weather, college athletic scholarships, injuries, accidents, philanthropic fundraising for poor children—for starters—and in seemingly random, overlapping order. And almost constantly, obsessively, addictively, they’re warming up for the game each Saturday with every manner of stretch, flexibility, agility and strength exercises. This is fierce, serious physical theatre, a 90-minute boot camp of gymnastic choreography tricked out with moving soccer balls. It’s easy to interpret this kind of extreme working out as an escape from some of life’s difficult challenges—acknowledging at the same time that hey, girls gotta play sports too. 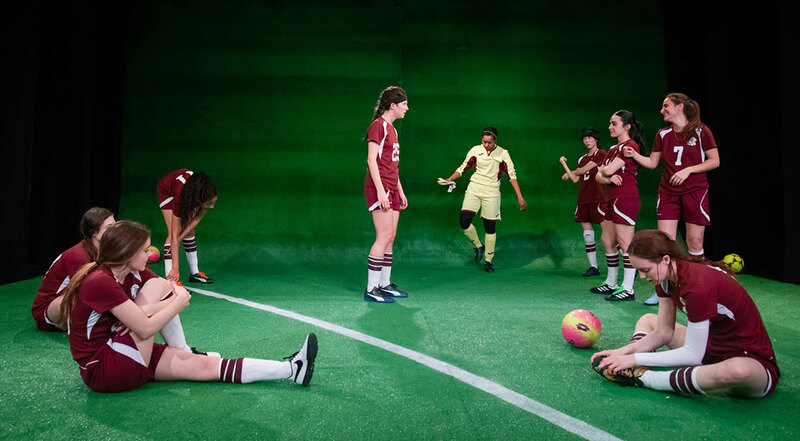 The entire action takes place on a large carpet of green astroturf that flows down from high up backstage to the front of the playing area (scenic design by Amanda Knehans). A single arc of white paint meant to delineate a section of the soccer field is the only departure from that field of grass. (They actually play on an indoor field at the City Sports Dome.) The action occurs “somewhere in suburban America” over a span of maybe several months, it’s a little hard to say, but things do happen over time. There is a Great Purpose here somewhere, and no one can fault the actors for their extraordinarily energetic dedication to trying to make this work. I don’t envy the director, who had the complicated job of keeping the volatile pin-ball dialogue moving along coherently while soccer balls are being kicked around. The Wolves is not so much a play, but a slice of life, a collective atmosphere and environmental snapshot of girls’ sports. But almost all of that Great Purpose is overwhelmed by far too much hyperactivity both physical and verbal, sweat and busy-ness, and wasted time that fails to contribute to the drama. The playwright’s reach has exceeded her grasp. I think there is the outline of an eventually effective play here (Pulitzer Prize nom and its apparent success in the Big Apple notwithstanding) but there would need to be a lot less dribbling and a lot more plot and character that’s about real, named characters, not numbers. I doubt any changes will be made to the script at this late date, however: It’s already an established work. I can appreciate the conceit as an intellectual effort, but right now the performance places heavy demands on a theatergoer without sufficient compensatory reward. 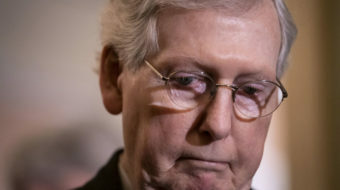 Speaking of numbers, I got to thinking, this is like a piece of pointillist art by Georges Seurat rendered in paint-by-number for amateurs at home and left half completed out of boredom. Maybe DeLappe’s post-modern point is basically the physical and verbal exercise itself, but if so, then I guess I missed it. I just don’t get how that’s supposed to engage a theatre audience for an evening. However, I know that others in the audience, including some critics, appreciated the piece in ways that I did not. Could be that I’m just not that much into sports. The Wolves plays Fri. and Sat. at 8 pm, Sun. at 4 pm, and Mon. at 8 pm through April 22 at Atwater Village Theatre, 3269 Casitas Ave., Los Angeles 90039. For reservations and information, call (310) 307-3753 or go to www.EchoTheaterCompany.com.